Online filing of Admission Forms for all old students are still open. Please visit the site regularly for latest news of Admission and Counselling Schedule. This institution initially known as Imperial College, Ludhiana was established in 1920. It has made immense contribution to the academic sphere of the region. Later the name was changed to Govt. College, Ludhiana. Under the aegis of the principal A.C.C. Hervey, who served in this college with great dedication for 15 years (1927-1942), it developed into a premier institution and ever since it has grown from strength to strength. In 1976 in recognition of the service rendered to the nation by its alumnus Satish Chander Dhawan, a renowned Space Scientist, the college was rechristened as S.C.D. Govt. College by the Govt. of Punjab. Under the stewardship of very able principals the college has been serving thousands of students for ten eventful decades and is now heading for a century. This institution has provided the brightest minds to the world of science, humanities, commerce and IT sector. 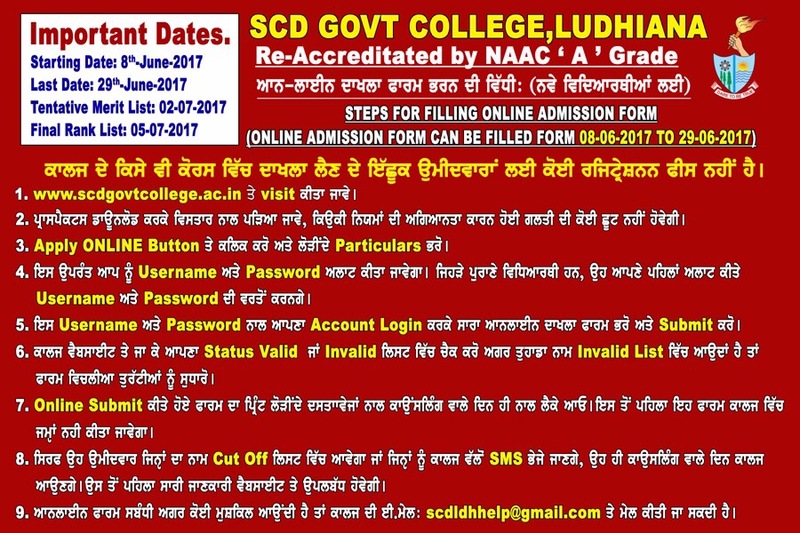 Set in the midst of this buzzing city of Ludhiana the college has become a byword for academic and extracurricular achievements. The college grounds with their sprawling lawns, lush trees and flowers provide a calm and tranquil environment. Service to the community is the hallmark of the students of this college. NCC (Army & Wing), NSS, Sports Wing has encouraged individuals to reach out and make a difference. Those who are working in the morning can also receive education at SCD Govt. Evening College that started in 1966. The sportsmen of this college have made their mark on the global map. The illustrious Alumni, the pride and strength of the college, have adorned some of the highest offices in the country. The college main hall is dedicated to Sahir Ludhianvi , the legendary Urdu poet who was an alumnus of the college. Apart from Satish Chander Dhawan and Sahir Ludhianvi, Personalities like Sh. N.N. Vohra (Governor J&K), Gen. T.N. Riana, Major General Himmat Singh Gill, S. M.S. Gill (Ex. MP & Ex. Chief Election Commission), Sh. Keki N. Daruwala (Famous poet and short story writer in English Language), Col. Avtar Singh Cheema (Arjuna Awardee & Padma Shri Awardee), Sh. Harkrishan Lall (Distinguished Punjabi Painter), S. Joginder Singh IPS ( Former Director, CBI, India), S. K.P.S. Gill IPS (Former DGP Punjab and Padma Shri Awardee), Sh. Mohan Sehgal (Director, Producer in Indian Film Industry) S. Jagpal Singh Sandhu (IAS), Brig. Sanjiv Dutt (SM), S. Rupinder Singh (IPS), Entrepreneurs like Sh. Rakesh Bharti Mittal, S. Onkar Singh Pahwa and Sh. Manoj Singla, Sh. Yashpal Sharma (Famous Cricketer) and Arjun Awardee Sportman like S. Sajjan Singh Cheema, S. Manmohan Singh and S. Sukhpal Singh have contributed richly to the growth of the country. Ten departments impart post-graduation opportunities to the students. A superbly equipped and expertly maintained library with computerized data caters to the academic needs of the young scholars. Smart classrooms, seminar hall, computer labs, gymnasium, stadium, auditorium, canteen, cafeteria, open air-theater and qualified administrative staff provide infrastructural support to the institution. Separate hostel facilities are available for both boys and girls. The glorious tradition of the college has been maintained by holding National and International seminars, Youth festivals, Educational tours, interactive sessions, quiz contests etc. The counseling cell provides guidance for placement and career opportunities. The college magazine ‘SATLUJ’ is a showcase of talent in writing and other prize winning achievements of the students. Out greatest strength is the outstanding faculty of the college. The teachers research and publish extensively, present papers at conferences worldwide, win accolades and yet consider themselves as teachers first. We are dedicated to maintaining, steering and moving in this joyful, eventful and productive academic quest in the challenging times to come. Candidates must mention their Applicant ID, OTP, Registered Name, Father's Name, Mother's Name, Date of Birth & Mobile No/E-Mail ID in their mails.